Files with ccd file extension can also be found as compiled CAD programs from Vector CAD CNC programming tool. 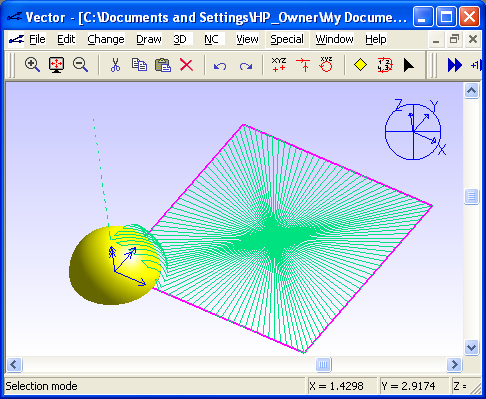 The ccd file extension is also associated with the Vector CAD, a Microsoft Windows tool used for programming drilling, milling, turning, wire EDM, laserscutting. The ccd file stores program written in the Vector CAD for CNC machine. Vector CAD is drawing and CNC programming system for Microsoft Windows. The Cad drawing is easy to learn and use, and fully windows compliant. Vector is a full time 2D and 3D surface modeling Cad drawing system, and can import and export dxf, iges, stl, and 3dm files from other drawing systems. Use Vector CAD to open *.ccd program files. This file type does not seem to be used for any kind of conversion. However, it may be possible that some 3D models / CAD files can be compilted on it so they can be loaded to CNC machine. Click on the tab below to simply browse between the application actions, to quickly get a list of recommended software, which is able to perform the specified software action, such as opening, editing or converting ccd files. Programs supporting the exension ccd on the main platforms Windows, Mac, Linux or mobile. Click on the link to get more information about listed programs for open ccd file action. Programs supporting the exension ccd on the main platforms Windows, Mac, Linux or mobile. Click on the link to get more information about listed programs for edit ccd file action. Programs supporting the exension ccd on the main platforms Windows, Mac, Linux or mobile. Click on the link to get more information about listed programs for create ccd file action.